Our partner school in Granada, Delengua, is located in the centre of Granada, in the beautiful Albayzin quarter. Just 1 minute from Plaza Nueva and 5 minutes from the famous Alhambra and Calle Elvira which is full of bars and clubs and ensure you a vibrant nightlife. The school is also surrounded by many Arabic shops that sell a huge variety of interesting and unique items. The school was founded in 1997 and its historical building has been recently renovated. There are three floors and a terrace with a panoramic view over the centre of Granada. On the 2nd and 3rd floors there are fully-equipped apartments with kitchen, washing machine, sitting room, TVs, bathrooms and numerous bedrooms (free wireless internet access is also available). On the first floor there are some classrooms. On the ground floor is the language school office, the library, other classrooms and a patio where the students meet for their activities. 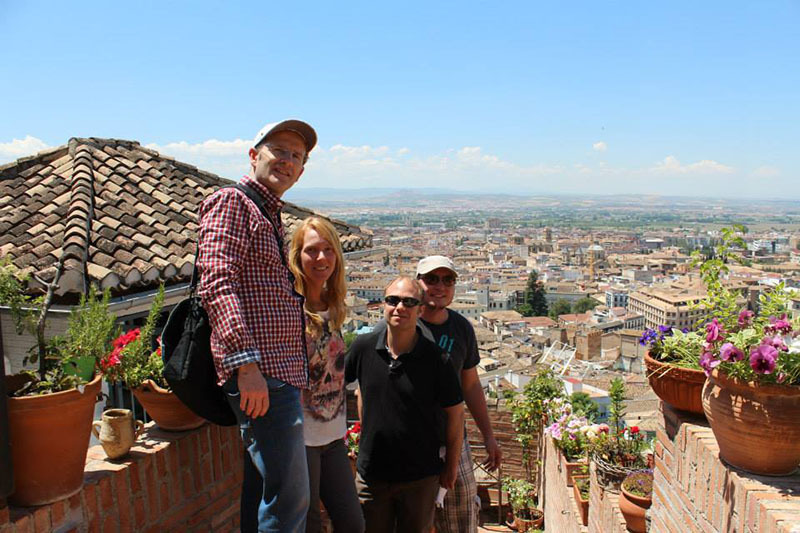 The language school Delengua has everything you need to study Spanish in Granada. Spanish books, films and music. The activity program will be an important part of your stay in Granada. Through the activities that the school organizes you will get a deep insight into the Spanish way of life, and the history and culture of Granada and the surrounding area. It is also a great way to get to know other students from your Spanish course. During the week daily activities are offered and excursions are offered mostly on weekends. A teacher always leads the excursions and they will be able to answer any questions you may have about Granada and its history. Conferences and talks on literature, history, art, etc. The Spanish courses are focused on communication and action: the main priority is effective communication and correct situational usage. Thanks to a carefully designed programme covering all aspects of language, a great number of different topics are covered in an intensive manner so that maximum progress is guaranteed. The curriculum used by experienced teachers is focused on a direct communicative approach. As a result of this, the dynamic courses involve active participation from all students. Please indicate on the booking form at which airport you would liked to be picked up. The school will be closed (= no lessons) on: 19/04/2019, 06/12/2019 and from 23/12/2019 - 04/01/2020. Lessons are not made up. With the combined course you will have 4 classes daily of Intensive Spanish course in a group plus 1 or 2 classes of individual lessons. This way, you get an in-depth view of the Intensive course topics or create your own programme: conversation, grammar, literature, history of art, commercial or technical Spanish, etc. You decide the content and do it at your own pace. This course prepares your for the DELE exam. The course combines an intensive general Spanish course with extra lessons focused on exam preparation. You will have 4 lessons of General Spanish in a group and 2 extra lessons per day in groups from 2 to 5 students per class. This course is suitable for all levels. To read more about the DELE exam, please click here. The exam fee is not included and depends on the level of the exam. Depending on the exam date for your level, you might need ot book an extra night of accommodation (price on request). The Flamenco course will give you the opportunity to get closer to the world of Flamenco. Andalusia is the best region to learn and get to know Flamenco, as it was born there. In Granada, you will enjoy Flamenco shows in the "Tablaos" of the Albaicín and the Sacromonte (the gypsy neighborhood of Granada). The Flamenco course in Granada can be only be booked in combination with an intensive course. It is also possible to combine the flamenco course with another language course other than the intensive. You do not have to take the flamenco course during the whole period of your language course. You have 2 classes daily, from Monday to Thursday in groups of up to 5 students. The classes take place in the evenings after the Spanish classes. Within this course you will improve your Spanish for business purposes. You will study the vocabulary that is used in Spanish companies or the international market. The exact subjects of study can be adapted to your specific needs. In addition to the Intensive Course you will have 4 classes daily (Intensive Course) plus 2 additional daily classes on business. Visits to Spanish companies are included. The courses have a duration of 2, 3 or 4 weeks and a minimum level of B1 is requested. Contents include specific vocabulary, practical business skills like phoning, meetings, negotiations, interviews, letters, writing a CV, etc. The Commercial Spanish course is aimed at all those who want or need or improve their Spanish for business purposes. If you are a professional in the business world, or a student of Economics, Business Studies, or a similar subject; the course will be of interest to you. As well as vocabulary and practical skills, you will gain a general understanding of the Spanish economy. The various sectors of the economy will be analyzed and you will look at how businesses and banks function, as well as taxes, the stock market, imports and exports; and the relationship between Spain and the rest of the EU. The language school uses authentic material: newspaper and magazine articles, to give you a true vision of the current business world. The Commercial Spanish course includes at least one practical visit to a business in Granada or an official organization related to the world of business. With the one-to-one course you will have 4 classes daily of individual Spanish lessons. This way, you get an in-depth view of the topics or create your own programme: conversation, grammar, literature, history of art, commercial or technical Spanish, etc. You decide the content and do it at your own pace. The Spanish host families are carefully selected. Spanish families may live up to 20 minutes walking distance away from the school. You will stay in a bedroom and will share the house and eat together with the family. You will have a key to the house. The family will also do your laundry and clean for you once a week. The price includes half board, i.e. breakfast and one meal per day. You can book accommodation in shared apartments with other students in a double or single room. The comfortable and spacious apartments are shared with other students. Between 2 to 5 people share each flat. Sometimes flats can be for more people. The flats are in the centre of Granada, normally between 1 and 10 minutes walking distance from the language school. A single-use-apartment is the perfect type of accommodation if you want your own privacy and facilities. The private apartments are located in one of the most beautiful and picturesque areas of the city at the feet of the Alhambra and the Paseo de Tristes is within walking distance. The area is also full of a range of bars and restaurants.The flat is on the ground floor of a typical build in the Albaycin area, at only 10 minutes from the school. Everything is decorated tastefully and to a high quality.